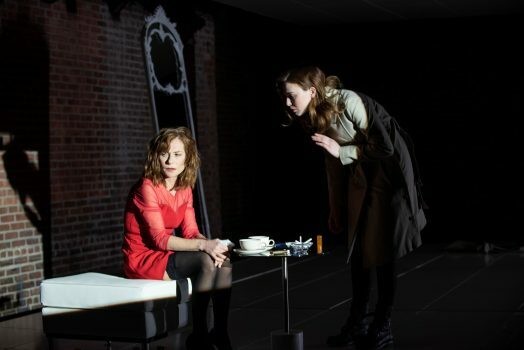 NEW YORK—The turmoil of a confused, failing mind is examined in French playwright Florian Zeller’s “The Mother.” Translated by Christopher Hampton and having its U.S. premiere at the Atlantic Theater Company, the work is an attempt to view one woman’s disintegrating psyche from the inside. Anne (Isabelle Huppert) is a middle-aged woman in an unhappy marriage. Once completely devoted to her two children, she has precious little to do now that they have grown up and moved away. She prefers to stay inside and brood about what she has lost rather than trying to get on with her life. It doesn’t help that she and her husband, Peter (Chris Noth), have grown apart over the years, though exactly which of them is to blame for this is impossible to say. On this day, Peter is preparing to leave for a four-day work-related seminar. Anne, however, is convinced that Peter is planning to dump her for a much younger woman. This accusation he vehemently denies. Anne equates Peter’s pending departure with the fact that both her children have left her. She’s especially hurt by the departure of their son Michael (Justice Smith), and the fact that he’s now living with his girlfriend (Odessa Young). Anne is so jealous of this new woman in her son’s life that she refuses to say her name aloud correctly. It’s not long before it becomes obvious that something is amiss. Anne’s actions and comments change from ones that initially seem funny, snide, or deliberately obtuse (such as her continually asking Peter how his day has been), to something bitter, mean-spirited, and at times, overtly sexual. This effect is accomplished by the replay of certain scenes and dialogue, with the different characters altering their delivery accordingly. Anne changes the most during these moments, with a clear indication that she is suffering from some form of mental disorder. “The Mother,” the second in a trilogy of plays by Zeller about family, offers some tantalizing possibilities, with an early sequence being especially funny. Noth and Huppert have excellent back-and-forth banter here, even though it soon becomes obvious that what we are seeing is anything but comedic. While running through the entire work is the importance of Anne’s dignity—even as she quickly becomes unlikable for her actions—we soon realize that we are seeing pretty much the entire play through the prism of her mind. She reacts to situations as she perceives them, not necessarily as they actually are. This premise is a major misstep by the show’s creative team. We are left to determine what, if anything, presented has some basis in fact. Without a clear fixed point to serve as a reference or anchor, it’s impossible to figure out who to believe on any subject. As such, any opportunity to connect to the characters is lost. We are reduced to passive observers, with little chance to become emotionally invested in what those on stage are experiencing. It doesn’t help that there is little character development in the play. The intention of the playwright may have been to keep the audience guessing as to what is real and what is not, but it would have been far better if some sort of backstory were included for these people. Everything that is offered is colored by Anne’s own personal filters, no matter how damaged they might be. Huppert is excellent as a woman whose life is falling apart. Her descent was perhaps, at one point, of her own making, but she has long since lost any control over it. 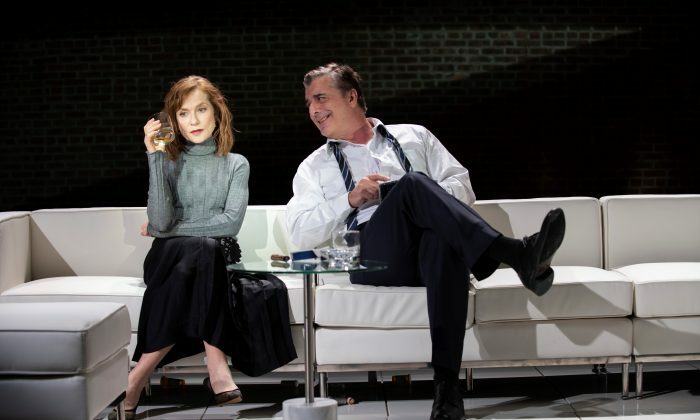 Noth, basically relegated to a reactive character, comes off wonderfully in the early portion of the play as a befuddled husband, with a perfect, slow burn, as he tries to make sense of his wife’s actions. Smith is fine as the son, although some insight as to the exact nature of Anne’s relationship with her son would have made the play much more effective. We can assume it included overprotection on her part to the point of obsession. Young, the only actor who plays multiple roles in the show (such as the husband’s girlfriend, a nurse), is quite good. Her turn as Michael’s girlfriend is particularly striking. She’s initially a loving and caring person who turns into someone quite callous and cruel, all depending on how Anne happens to see her at any specific moment. Trip Cullman’s direction is fine as far as it goes, but it can’t overcome the weaknesses in the script. Mark Wendland’s set is nicely antiseptic, and Ben Stanton’s harsh lighting works quite well. Yet their efforts only serve to further defuse the story rather than allow it to coalesce into anything more substantial. It’s interesting to note that the play script subtitles the show as “a black farce.” This distinction, though, is not mentioned in the actual theater program or the press materials. While “The Mother” touches on a subject the playwright obviously cares deeply about, the work refuses to let the audience get any closer than arm’s length and reduces a potentially powerful message to little more than an afterthought. Judd Hollander is a reviewer for Stagebuzz.com and a member of the Drama Desk and the Outer Critics Circle.